Once upon a time a man named Narhar Lal lived in a village known as Unchala along with his wife Asha. The village was surrounded by dense forest. He was a farmer and had a small land to cultivate. He earned enough from his land to lead a simple life. The couple were happy together, however they had no children. Narhar Lal was well known in his village for his good nature and kind heartedness. One day before leaving he said ‘Asha, I am going to the forest to fetch woods. I’ll try to get some vegetables from the Mandi on way back’. Asha said ‘Ok, come back soon husband, before it gets dark in the forest’. He went to the forest and fetched sufficient wood to last for a week. On his way back home, he saw a wounded python. Besides the python was a new born baby python. The wounded python was definitely the mother and was attacked by predators. He stopped by to take care of the python, however she died soon because of the severe injuries. Narhar Lal fell pity for the baby python and thought ‘I should take this python to my home and nurture it’. Asha was delighted to see her husband back, she asked ‘what all did you get from the mandi?’ Narhar said ‘Asha, leave all that. See what I got from the forest’. He showed the small python. Asha jumped in surprise ‘What is this? A Python’. Narhar explained ‘See Asha, we have no kids. At least we can take care of this python as our child and once it grows up, I shall take him back to the forest’. 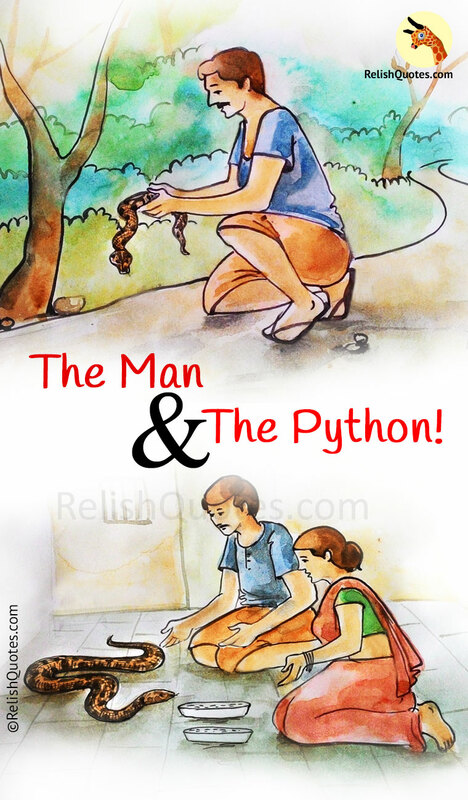 His wife agreed and they named the python as Kalia. Days went by, Asha and Narhar took care of Kalia like their own child. Even the villagers would appreciate their efforts and feed the python. Soon Kalia started growing in size and it would protect the house from mice and other small animals. The villagers and their kids would play with Kalia. It never harmed anyone. The couple was very happy with the python. One day when Asha kept milk in front of Kalia, it did not drink. Days passed by and Kalia did not feed on anything. Narhar was sad that Kalia was neither eating nor drinking anything. It would just lie besides Narhar all the time. Narhar would show love to kalia, pat his back, try to feed him but all in vain. Every night when Narhar would sleep, Kalia would sleep besides him. This went on for a week. Asha also felt sad and told her husband ‘I think it is the right time we leave him in the forest, he is missing the habitat and his species’. The villagers also advised the same. Narhar had brought up Kalia like his own child. He was deeply grieved and couldn’t think of living without Kalia now. He told Asha ‘I will show him to a doctor and based on his feedback, we will act accordingly’. Asha agreed. Next day, Narhar showed Kalia to a local veterinary doctor. The doctor examined the animal and asked ‘How long is the python with you’. Narhar: ‘In the nearby forest, when he was born his mother was attacked. She died on the spot. I brought Kalia with me and since then we are living together’. Narhar: ‘Sir, 7 days. He is not eating anything and he only sleeps by my side. He has become very dull’. Narhar: ‘He usually drinks milk 2 times in a day and feeds on mice, rats and protects our house’. Doctor: ‘Hmm. Ok. Narhar can you leave the python here and come inside with me’. Narhar: ‘Yes Sir, Please tell me what happened to Kalia. He is my life. I cannot live without him’. 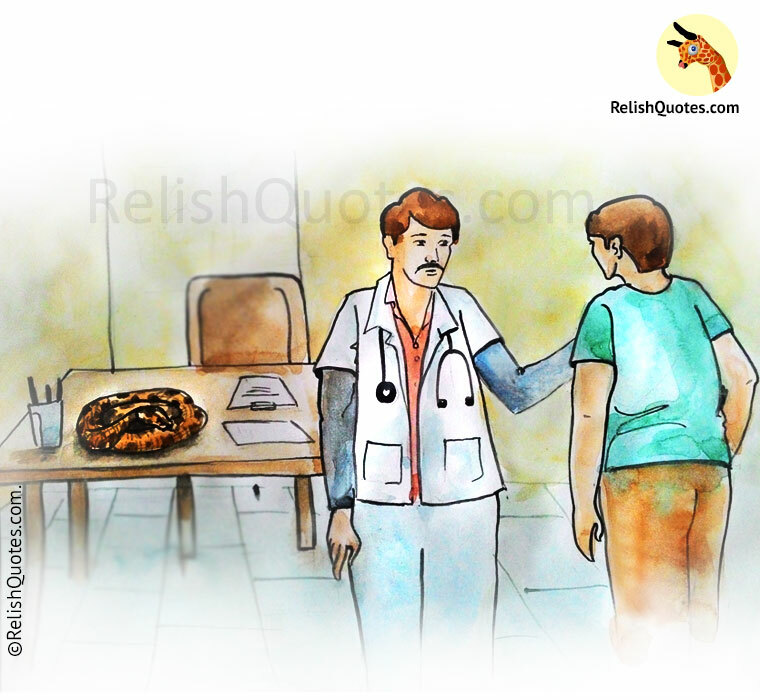 The doctor replied: “Narhar, go immediately to the forest and leave the python there. It is starving from last 7 days because it is planning to kill you!! It lays by your side not because he is suffering but because he is measuring the length of his prey to engulf. Go and save your life’. Narhar was shocked and did as the doctor had advised. Animal or human, they never leave their nature.